Part of the pleasure is unwrapping the package. It’s like opening a present! Oh you can smell the wonderfully baked aromas now...steaming hot, buttery and garlicky creamy scent! It is a beauty...button mushrooms redolent with garlic, turkey bacon, sliced red capsicum and moist grilled chicken doused with a satiny smooth cream sauce. A hint of Parmesan cheese enriches the sauce and gives it body. Everything is all bundled together to mingle and infuse the pasta with their lovely flavours. 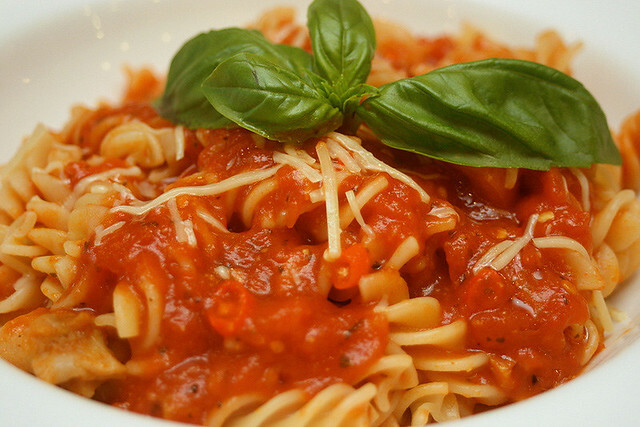 Pizza Hut uses Barilla pasta for better flavour and texture. And it really shows, because the pasta remained fairly al dente after baking, and even after a few minutes of photography. 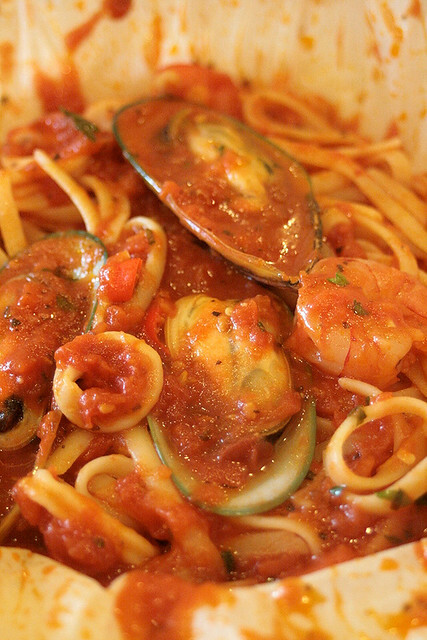 Linguini in spicy tomato sauce with mussels, squid and prawns. The sauce forms a well-balanced sweet, tangy and spicy background to the fresh seafood. I’m glad they didn’t hold back on “spicy” - they use a few slices of chili padi (bird’s eye chillies) to give the dish some well-deserved heat. But don’t worry, it won’t bite your tongue...much. The parchment pastas have made me quite curious about their other pastas. Pizza Hut revamped their menu some time back and included pasta dishes such as the Spicy Pomodoro Chicken (S$6.80). For this price, the pasta sure looks pretty darn good! 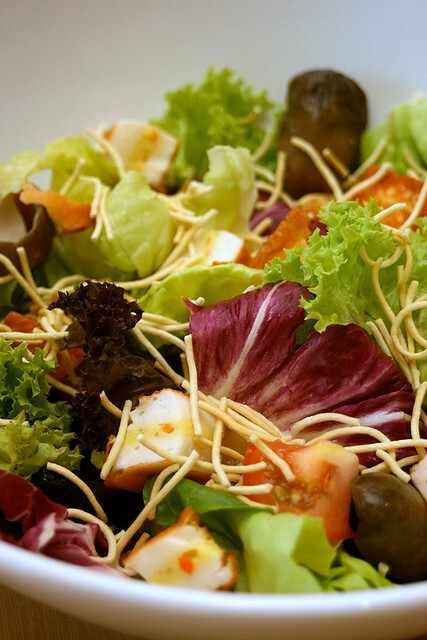 They also expanded their salad selection, to provide healthier options for dining. This is their signature Seafood Tofu Salad (S$6.90) - mesclun greens with straw mushrooms and crispy noodles, and is served with Italian dressing. It’s a generous serving for this price. I do like the seafood tofu - it tastes similar to some of the Japanese fishcakes. The drinks have also been jazzed up. 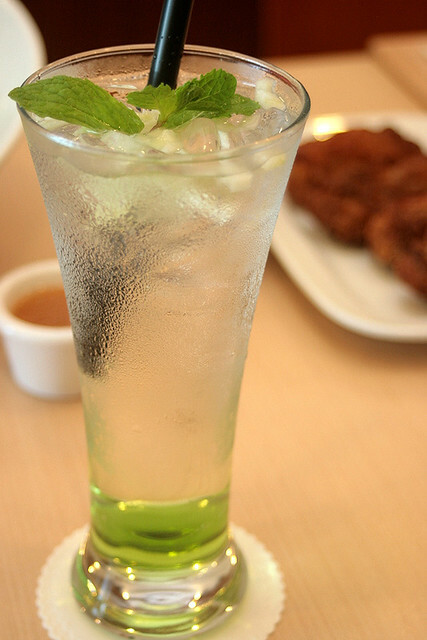 This is the Emerald Sparkle cooler (S$3.80), a green apple flavoured sparkling drink with chopped green apple and mint. Very refreshing. There are strawberry and mango versions too. 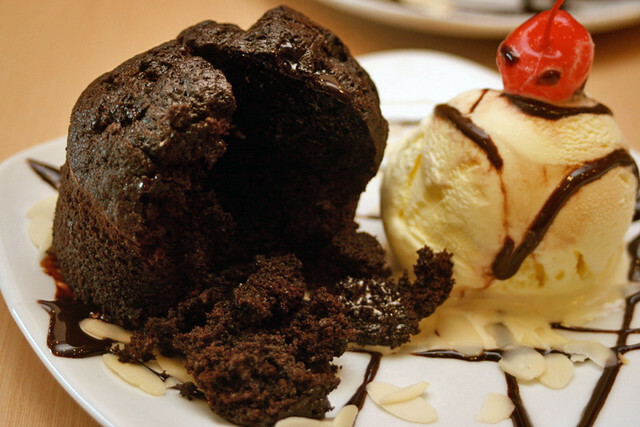 Their signature dessert is the Warm Chocolate Cake with Ice Cream (S$6.50). The two pair very well. I loved soaking up the chocolate cake with the vanilla ice cream. Despite feeling really full from both parchment pastas and the many side dishes, I still couldn’t help but finish this sweet treat. I haven’t been to Pizza Hut in years, so I’m pleasantly surprised to note how the array of new items have really updated this chain. Pizza Hut is now more than just pizzas, garlic bread and drumlets. There are healthy dining options, and even a couple of Crispy Thin Crust pizzas given the stamp of approval by the Health Promotion Board. You can see their full menu including prices on their website. P.S. I met Xiaxue in person at the tasting! She's cute. This is her post on the food. Actually for a point-and-shoot camera, her photos are not bad. 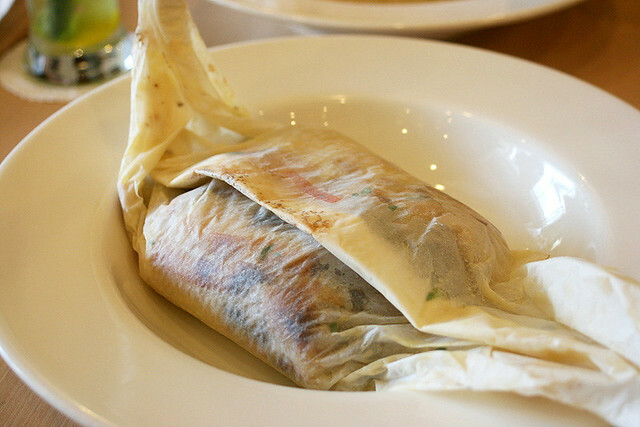 The wrapped pasta is naturally compacted and messy, so it's not easy to get photogenic shots of it. But we all had fun that day. Thanks to the friendly folks at Pizza Hut for the invite! Don't you have a 10ft pole? LOL@pole! Yeah I know. To be honest, I was somewhat skeptical at first. I hadn't been to Pizza Hut in years and my impression of it was stuck back in the 80s and 90s. But I'm glad I gave it a go. I was certainly surprised. 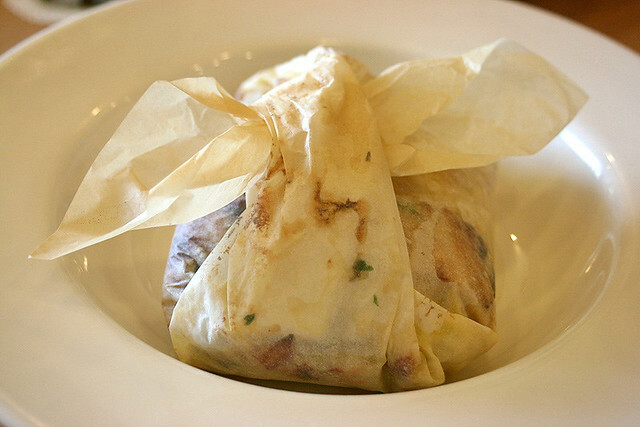 I really liked the char-grilled chicken parchment pasta and the seafood tofu salad. I would have declined the advertorial if I didn't like the food. For the price point, it's more than decent. I do intend to go back with my family again to try it on my own. I hope they keep this standard up! LJ: I'm going to try it again too. Keropokman just told me their other new pastas are also quite good! LFB: Show them what Singapore is doing! Malaysia mana boleh kalah? 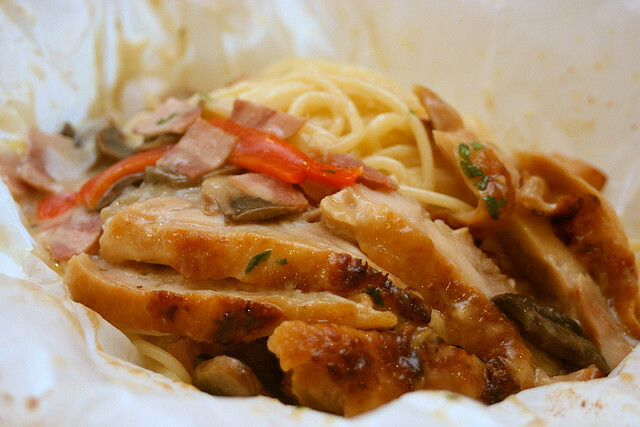 How about ayam masak merah parchment pasta? Wow. 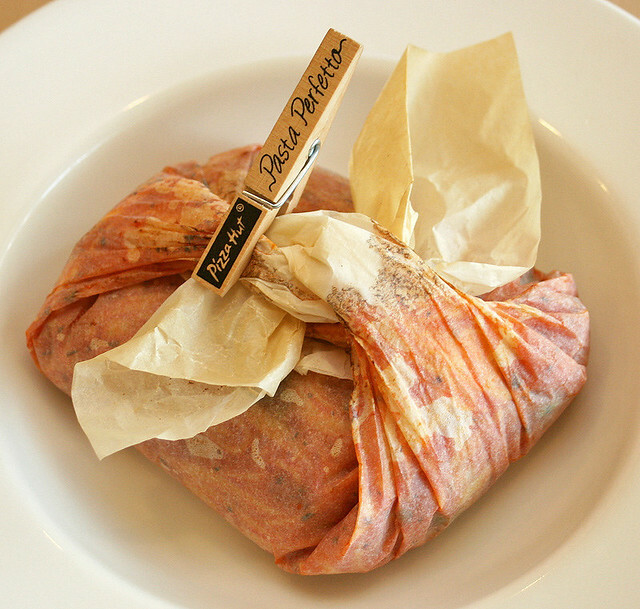 Your Pizza Hut sounds like it has a very different menu than we have in the states, however, I really like the idea of a pasta baked in parchment. I think I might steal that idea and use it in my own kitchen. OK, I brought the family for the parchment pasta today at the East Coast branch. With the Citibank 1-for-1 promo, we were given free another pasta (from the Classic range; or you can opt for a personal-size pizza). Hubby preferred the Pomodoro pasta, which was nice and came in a big portion, but tomato-based sauces are not my thing. The really stellar discovery we made was their thin-crust Pepperoni pizza. 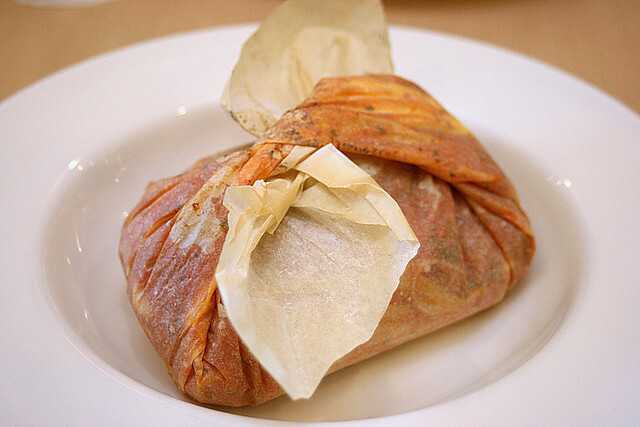 The crust and edges of cheese are baked to a yummy crisp. It's such a pity they don't deliver this - hubby pronounced them better than Domino's (his earlier favourite). With the Citibank promo, it really becomes a good deal for a family meal. Two pastas, one pizza, one appetiser platter and one drink came up to only S$43. It fed my family of four very well. Service was lovely - the waitresses were prompt, friendly and even entertained my kids! 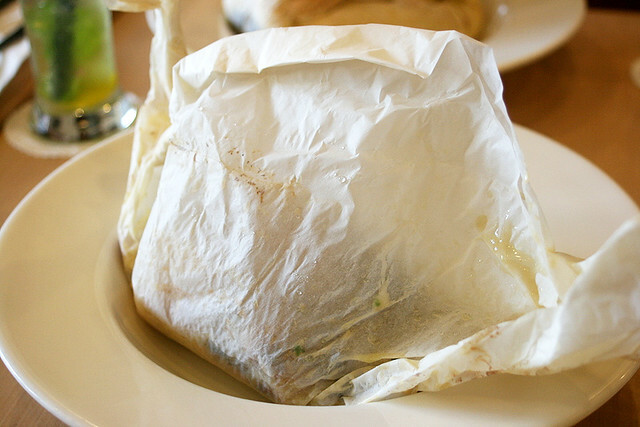 One of them also went out of her way to get me a wet wipe when I ran out of napkins. 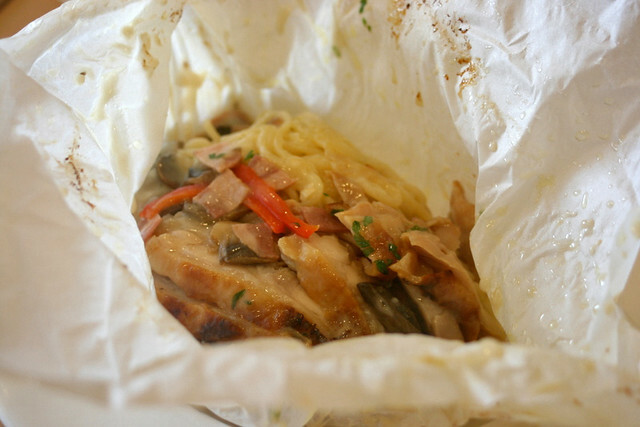 You can see photos of the parchment pasta here and the pizza here. This looks really really good. I'm glad you also posted about their warm chocolate cake as I'm a sucker for desserts. Haven't been to Pizza Hut for a long time too and this should definitely get me back at their restaurants. Yeay! I can't believe this is pizzahut!!!! I hope they have it in Australia.